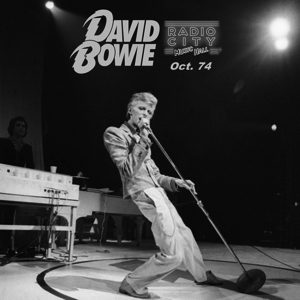 David Bowie 1974-10-30 New York ,Radio City Music Hall (Remaster). Information: Bowie performs Footstompin’ for the first time on this night. “Thank you very much ladies and gentlemen” one of the lady singers says after Stormy Monday. “You’ve been lovely. I’d like you to know that we really have enjoyed perfor­ming for you tonight.We love you and we’d love to come back, and we will”. 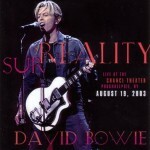 This was the first of a sequence of seven nights in New York and it is a great concert. However,not all the seven were as good: some of them started two hours late,Bowie was overtired. Actually only the first and the last were good concerts. Debo­rah Swamback from Rome ,New York saw the concert on Novemver I: “It only lasted fifty minutes,and tickets were $10.50 which was quite high a price back then,and my friends and I had tra­velled 250 miles to see Bowie,to return home imnediately after the concert. 500 Miles to see a fifty-minute show is a bit insane”. The Concert in Cleveland, November 6,lasted sixty minutes. It was proba­bly Bowie’s exhaustion that started to get the better of him. While still ostensibly part of the Diamond Dogs tour, this seven-night stand at Radio City Music Hall would present a completely different show, now referred to as “Philly Dogs” to denote the tour’s drastic swing from proto-punk apocalyptic nightmare to r&b revue. 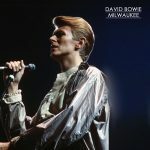 To the confusion of fans dressed as Ziggy and Aladdin, Bowie had already ditched the tour’s original concept — the elaborate set, which hadn’t fared well on the first leg, wouldn’t get farther than the West Coast — in favor of a band that included Robin Clark, Ava Cherry, and a pre-superstardom Luther Vandross on backing vocals (the backing band also performed a seven-song set of r&b material to open the show). All of Bowie’s hits were reinterpreted through this soul-based filter, to varying results; reviews were overwhelmingly not positive. The band was great (with the addition of Carlos Alomar, and David Sanborn’s role expanding due to the new arrangements), and the enthusiasm and desire was authentic, but there was just too much bombast. “Young Americans” is introduced as being from the forthcoming album, recorded back in August at Philly’s Sigma Sound.